Abcam’s Vimentin Human Profiling in vitro ELISA (Enzyme-Linked Immunosorbent Assay) kit is designed for the accurate qualitative measurement of total vimentin protein in Human samples. The assay employs an antibody specific to Vimentin coated onto well plate strips. Samples are pipetted into the wells and Vimentin present in the sample is bound to the wells by the immobilized antibody. The wells are washed and an anti-Vimentin detector antibody is added. After washing away unbound detector antibody, HRP-conjugated label specific for the detector antibody is pipetted into the wells. The wells are again washed, a TMB development solution is added to the wells and blue color develops in proportion to the amount of bound Vimentin. Vimentin is a type III intermediate filament (IF) protein that forms the cytoskeletal framework in the cytoplasm of eukaryotic cells. Other structural proteins such as actin and tubulin are highly conserved in different cell types, whereas IF proteins are expressed in a highly tissue specific manner. Due to vimentin being the major cytoskeletal protein in mesenchymal cells, it is used as a marker of mesenchymally-derived cells or cells undergoing epithelial-to-mesenchymal transition (EMT) during normal development and metastatic progression. Our Abpromise guarantee covers the use of ab173190 in the following tested applications. Typical standard curve generated when using the Vimentin Human Profiling ELISA kit. HeLa cell lysate, Jurkat cell lysate, SH SY5Y cell lysate, MCF7 cell lysate (not shown) and MDA-MB-231 cell lysate were tested using this kit. 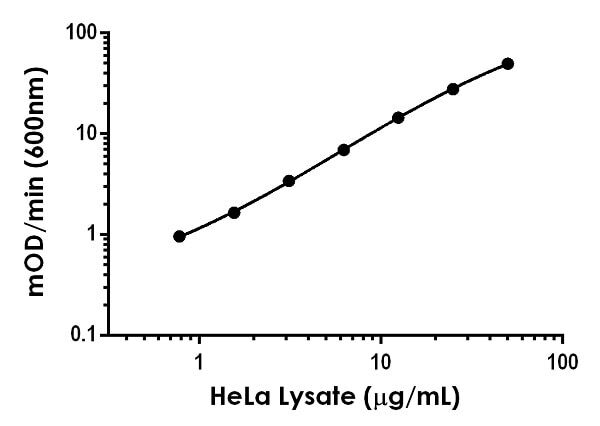 HeLa cell lysate shown as standard control sample, varying concentration other cell Lysates were analyzed within working range of the assay. 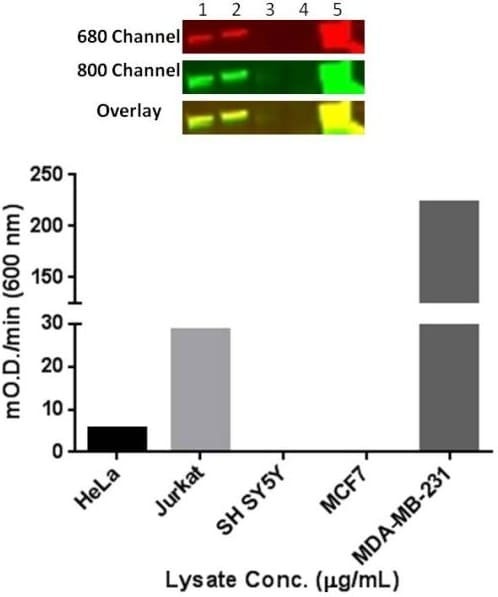 Western blot of cell lysates (top panel): 1) HeLa, 2) Jurkat, 3) Sy5y, 4) MCF7, 5) MDA-MB-231 (10 μg/lane) using primary antibodies: rabbit anti-vimentin (1/1000 dilution) and mouse anti-vimentin (ab8978, 1/1000 dilution); Secondary antibodies used were goat anti‑rabbit 680-RD (Red, 1/10,000) and goat anti‑mouse 800 (Green, 1/10,000). Blot was scanned using a LI­­‑COR® Odyssey® imager and overlay shows target specificity for total vimentin (yellow). 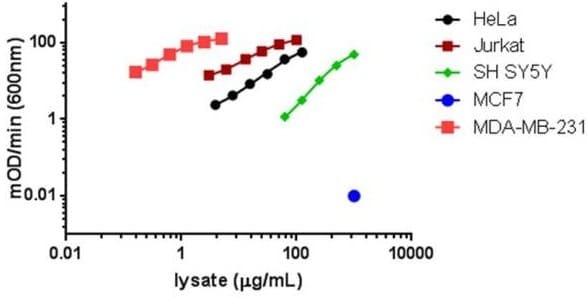 Bar graph (bottom panel) represents relative mOD/min (600 nm) observed for 10 μg/mL cell lysate, except for MDA-MB-231 cell lysate which reports mOD/min (600 nm) for 1 μg/mL. ab173190 has not yet been referenced specifically in any publications. Publishing research using ab173190? Please let us know so that we can cite the reference in this datasheet. There are currently no Customer reviews or Questions for ab173190.